US Senator Todd Young of Indiana (L) with Jeffrey Woda, Managing Director, Woda Cooper Companies, Inc. at the 2018 CHARLES L. EDSON TAX CREDIT EXCELLENCE AWARDS on Capitol Hill June 13, 2018.
the Rural Category in the prestigious 24th Annual Charles L. Edson Tax Credit Excellence Awards (Edson Awards) today on Capitol Hill. 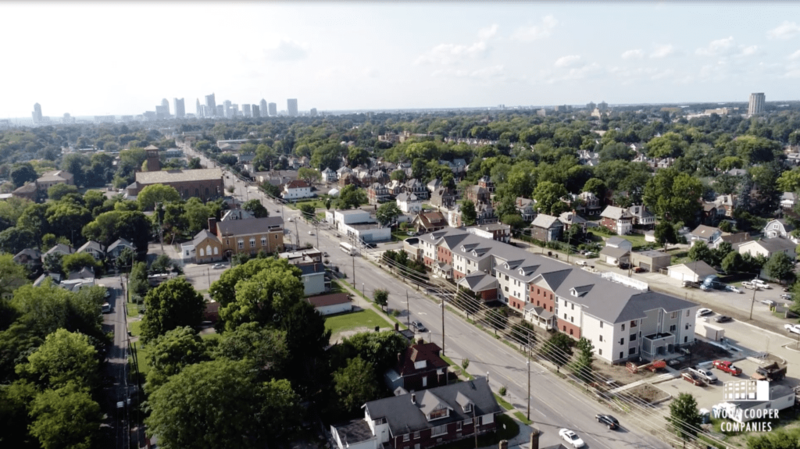 Each year the Affordable Housing Tax Credit Coalition (AHTCC) recognizes the best of the nation’s affordable housing communities supported through the Low Income Housing Tax Credits (Housing Credit). According to a press release by AHTCC, the named winners are those development strengthening communities, improving health, and boosting the economy in urban, suburban and rural areas nationwide. Atz Place has a multipurpose community room, a grandchild room, a fitness center, laundry, raised bed gardens, and a gazebo. The new construction site revitalized the abandoned former site of the former Atz Ice Cream Shoppe. Earlier this year, the community earned LEED Platinum certification for its many energy efficient features, including Energy Star appliances. According to AHTCC, the Housing Credit was created as part of the Tax Reform Act of 1986, and today is widely regarded as the nation’s most successful housing production tool. AHTCC indicates the program has financed more than 3 million affordable apartments through public‐private partnerships. The program has earned strong bipartisan support, and was recently preserved in the Tax Cuts and Jobs Act of 2017, and expanded and strengthened in the omnibus spending bill for fiscal year 2018. The broadly‐supported Affordable Housing Credit Improvement Act, currently up for debate, would further expand and strengthen the program. Woda Cooper Companies, Inc. and its affiliates are experienced developers, general contractors, and property managers specializing in the design, construction, and management of affordable multi-family apartments, senior communities, and single-family homes. Considered leading experts in the affordable housing industry, the Woda Cooper team is known for producing and maintaining high quality affordable housing. Affordable Housing Finance ranked the firm 6th overall among Developers and 29nth overall among Owners in its April/May 2018 issue. Woda Cooper Companies, Inc. has developed and currently manages more than 300 communities and 12,000 units, operating in 15 states. In addition to its headquarters in Columbus, Ohio; officers are operated in Annapolis, Maryland; Savannah, Georgia; Shelbyville, Kentucky; Norfolk, Virginia; Indianapolis, Indiana; and Mackinaw City, Michigan. For more information, call (614) 396-3200 or visit www.wodagroup.com.